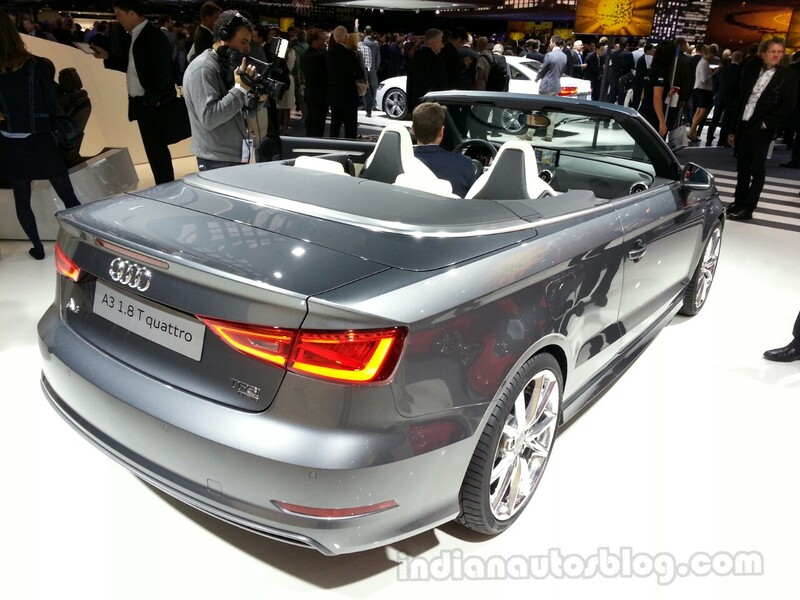 The 2014 Audi A3 Cabriolet, based on the MQB Platform, has just been launched here at the Frankfurt Motor Show. 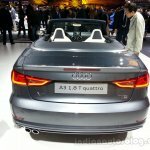 Compared to the outgoing version, the new A3 Cabriolet is 4.42 m long (as opposed to 4.24m), 2.60m long in wheelbase (up from 2.58m), 1.79 m tall (up from 1.77m) and at a height reduced by 15mm to 1.41m. Sticking to the spec sheet, the luggage capacity has grown by 60 liters, and the wheels can be up to 19 inches in size. At 1,365kg, the new model is 50kg lighter. 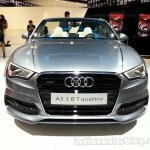 The Audi A3 Cabriolet's front-end is characterized by the Singleframe radiator grille and resolute looking headlamps. Headlights with LED technology is available as an option and they offer variable headlight leveling control. An aluminum-look trim strip surrounds the car, and on the flanks, designers have introduced a taut crease to create "a fascinating interplay of light and shadow." The new A3 Cabriolet features a soft cloth top that is stretched by a kinematic mechanism made of magnesium-steel. The roof takes 18 seconds to close and is operable at speeds of up to 50kph. Customers can choose the body in 16 colors. 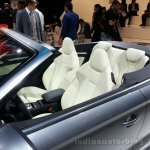 The Cabriolet's familiar interior doesn't break new ground with the novelties restricted to trim strips, aircon vents inspired by a jet, and a touch-sensitive reading lamp. The seats and steering wheel have also been redesigned. Equipment wise, the car gets Bang & Olufsen sound system, MMI Navigation plus on a 7-inch monitor, and a touch-sensitive pad for input. At launch, drivetrain options are comprised of three newly developed motors that are currently employed on the A3. These are the 140hp 1.4L TFSI, 180hp 1.8L TSI and a 110hp 2L TDI. Start-Stop system comes standard. The bigger petrol engine is paired to a seven-speed S tronic gearbox, while the other two engine are married to a 6-speed manual. 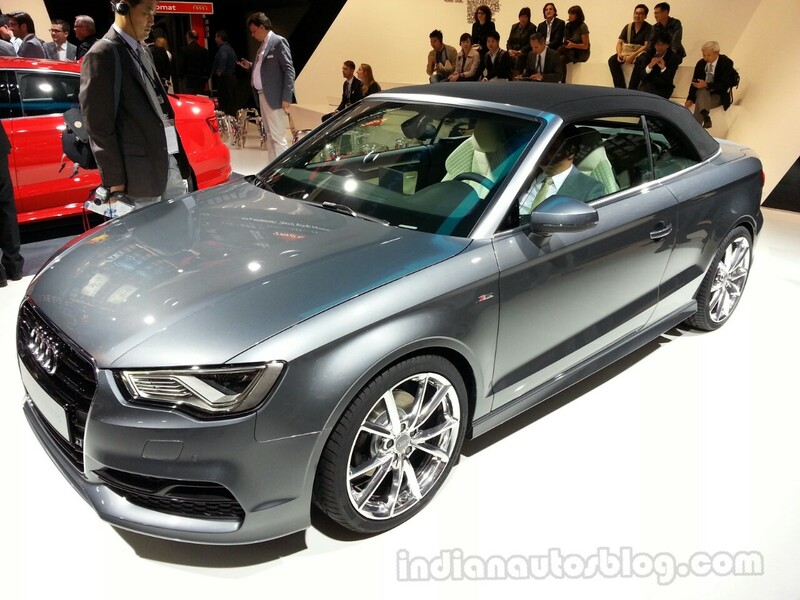 The new Audi A3 Cabriolet will be made at Audi's Gyor plant in Hungary. The base model (1.4L) is priced at 31,700 euros (27.25 lakh rupees). The press release on the next page has more details.